I’m not one to wear white, especially with little ones about, but after being inundated by ads with white summer dresses, I seem to want one of my own. I’ve always loved Japanese sewing books, but I’ve never sewn anything using one of their patterns. I’ve been requesting them through the library and drooling over all of the cute dress patterns. I love the way they pair their patterns with outfit ideas. It reminds me of the knitting patterns in Knit Scene; I just love those outfits! I especially like the patterns in Simply Sewn by Michiyo Ito. 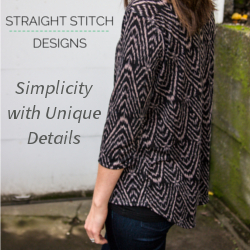 The patterns in this book are very wearable and really simple. I decided to use the Shabby Chic Dress pattern. Now tracing this pattern was a total a pain. I used swedish sewing paper, but keeping track of which pattern I was to trace was next to impossible. Mind you this is a library pattern, I can’t mark on the original pattern at all. I had to really study the pattern lines I wanted, then attempt to remember them while tracing. After screwing up a couple of times, I was able to trace what I needed. The fabric I chose was probably not the best choice for this dress, but it’s the only white fabric I had on hand, and I really like the design of the fabric. I decided to sew the dress immediately and not bother with sewing up the swedish sewing paper as a muslin. I needed the dress in a few days, and I just didn’t want to mess around (really, haven’t I learned anything, this never works!). After I had sewn the dress together, but not finished it, I tried it on. It was enormous!!! It reminded me of the mumus my grandmother used to wear. After taking it in several times (I think like 3 times), I ended up removing 2.5″ under the sleeves, 3″ around the armpit, and about 4″ at each side. I straightened the sides because I wanted a slimmer looking dress. I also shortened it by about 4″. I actually hemmed the sleeves and didn’t use elastic at first, but the sleeves looked a little bell-ish, so I decided to add elastic. Next time if I don’t want to use elastic I would take some width off of the sleeves at the shoulders (I had actually finished the neckline per the instructions at the beginning, so that’s why I didn’t alter that area). I definitely want to try more patterns from this book as well. Since I’m tracing with Swedish sewing paper, I can actually sew that up to test for size before cutting into my fabric. Have any fabric recommendations for this dress that I should try? Have you tried any of the patterns in this book? Please share!